The Che Cafe Collective is a San Diego DIY Venue, Vegan Cafe and Radical Space that was founded in 1980. We are a worker's collective and we are volunteer run. We have collective meetings on Mondays at 7pm and make decisions using consensus. Doors prices range from $5 to $15. Cash Only. Events typically start at 7:00pm and go until 11:00pm, unless otherwise noted. We're not a bar, we strive not to run on bar time. We stick to an early schedule to accommodate the bands, our volunteers, and the all ages crowds that often have curfews. More importantly touring bands appreciate it when they are not leaving at an absurd hour, because the show started late. Anyone can volunteer at the Che - it doesn't matter how old you are, or if you're student at UCSD. Help is needed at virtually every event that goes on here. Working in our co-op / workers' collective, and learning to cooperate with others in a non-hierarchical setting can be a very valuable experience. Benefits to volunteering at events are free admission and food (if food is being cooked). So please come out to any event to volunteer. Please note that the amount of volunteers needed for events is often limited. If you wish to volunteer try and show up an hour to half an hour before the listed door time. Or Make yourself known by coming to our weekly meetings. 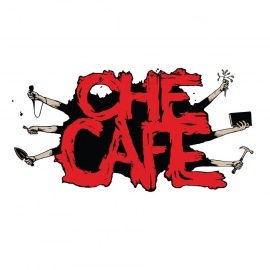 The Ché Café is a worker co-operative, social center, and live music venue located on the University of California San Diego campus in La Jolla, California, USA.